Chasing bronzebacks on the fly can turn the dog days of summer into hottest fishing of the season. Ounce for ounce, smallmouth bass can provide the fly fishing angler with best fighting, tail dancing action of the summer season. From the tiny creeks of Northern Illinois and Wisconsin to large Michigan Rivers, summer smallmouth fishing will test your skills on the surface and deep in the water column. Our one day class will provide fly anglers with a variety of top water and streamer tactics that will help you fish confidently throughout the summer months. How to read the water and identify holding lies, structure and ambush points. Casting instruction, line manipulation; mending and stripping strategies. Hook setting techniques, strategies and methods for various presentations. Presentation methods including top water, streamer and sink-tip tactics. Scouting and exploration tactics for targeting productive water. Rods, flies, sink tips and leader material will all be provided. You can bring your own rod(s) – a 9-foot, 6-8 wt single hand rod is recommended. Classes are held on the Kishwaukee River, in Cherry Valley, Illinois — which provides a great visual learning environment and an concentration of both rock bass and smallmouth. The class runs from 2 p.m. to sunset. Cost $225 for one person and $75 for each additional angler (maximum 3 anglers). $100 non-refundable deposit (can be used for any re-scheduled class). 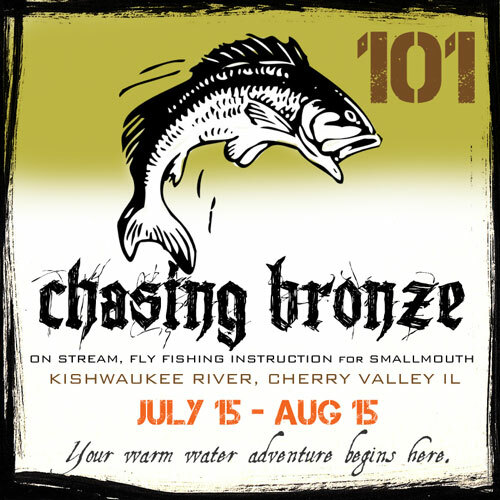 The “Chasing Bronze” class runs from July 15th through August 15th — call 815-341-9609 today for reservations.